The release of Planning Analytics Local (PA Local) is finally here! PA Local brings IBM’s cloud investment to on-premise IBM Cognos TM1 and IBM Cognos Express customers. What is Planning Analytics Local? 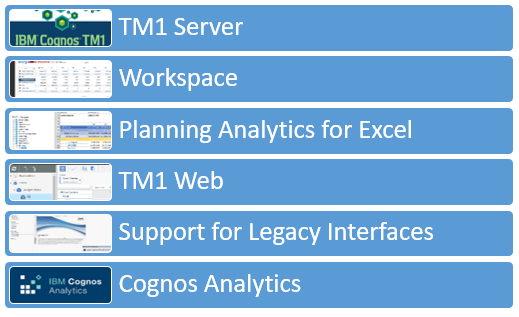 PA Local is the newest release and rebranding of IBM Cognos TM1. PA Local brings substantial changes and updates to the TM1 product line, which this blog post summarizes. PA Local has its own version number and brings a new continuous-development release cycle to the product offering: the brand-new Workspace component will have updates available about every 4-6 weeks. The server components will continue to follow a traditional release cycle consisting of Fix Packs and new versions. Note: if you are a current IBM PA on the Cloud customer, nothing is changing. PA Local simply brings what is available in the PA on the Cloud to non-cloud customers! Some of these, like TM1 Server and TM1 Web, are familiar, but others are either brand new or significantly updated versions of other products. Planning Analytics local also includes a version of Cognos Analytics (previously Cognos Business Intelligence) that is limited to reporting on PA Local data. The rest of this post covers some of these new components and other important enhancements in the new PA Local offering. Workspace is the new foundation for PA Local. 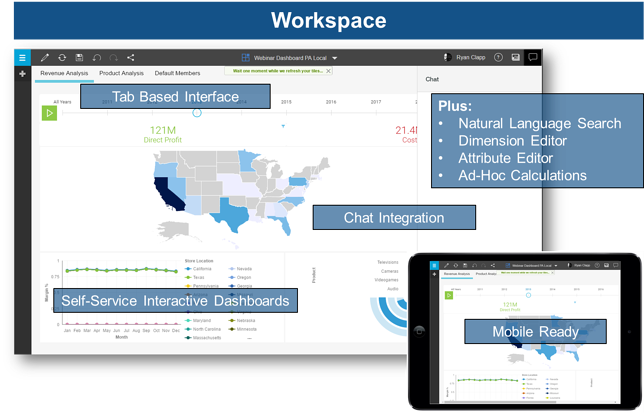 Workspace is a web-based tool that was originally developed on the cloud and provides a rich, user interface ideal for exploring and visualizing your TM1 data. Workspace includes support for all of the new features included in PA Local, including new hierarchies support. PAx is the new excel interface for Planning Analytics, and takes the place of CAFÉ. PAx has a totally new look and supports many features Perspectives users have come to love. PAx even incorporates a new cube browser and set editor: the exact same one used in Workspace. While PAx is the future of TM1 data access from Microsoft Excel, it does not yet include all of Perspective’s reporting features and, thus, TM1 Perspectives is still available in PA Local. Each release of PAx will incorporate more Perspectives features. 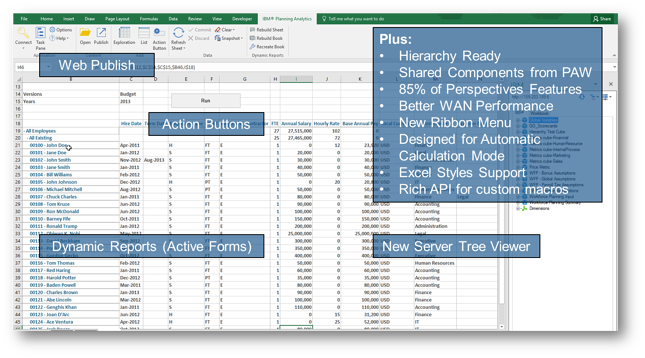 PA Local brings the long-awaited hierarchies feature to the TM1 product line. Hierarchies will change the way you model your business in TM1 because it is a fundamental shift in standard TM1 architecture. In the new architecture, a dimension is a collection of hierarchies, not elements. This will allow users to turn attributes or other information into virtual dimensions to better filter and consolidate data. Hierarchies will also make it easier to clearly separate and use alternate hierarchies in a dimension. Indeed, hierarchies also enables adding a dimension to a cube view multiple times, for example allowing you to browse products by color, category, and size all at the same time. Most importantly, hierarchies will result in simpler cubes with fewer dimensions, lower RAM footprint, and increased query performance. Those applications that do not fully support hierarchies will, instead, rely on the default hierarchy for each dimension. TI Debugger: Track variables, set breakpoints, view locks! What’s Next for PA Local? PA Local is a MAJOR release, and if you are interested in upgrading we highly recommend taking the time to prepare for, research, and understand how it may provide benefits to your existing TM1 on-premise implementation. If you are currently using TM1 on a PM Advance license, please contact QueBIT for more information on how your license entitlements can be converted to PA Local. In connection with the PA Local release, QueBIT is releasing a full suite of training offerings. Please look out for announcements in the New Year! Schedule your PA Local enablement workshop or demo right away! Stay tuned for our PA Local blog series where we will be reviewing many of the new features and how they can help your business.